The Canvasback is an elegant and distinctive diving duck with a long sloping forehead and long, black bill. Unlike many of other ducks, the Canvasback occurs exclusively in North America, but is one of the least abundant ducks on the continent. The Canvasback occurs in Tennessee during the non-breeding season from late October to late March, in areas of ice-free deep water. This species breeds from central Alaska to central Canada southward to Nevada and Minnesota. Canvasback winter in the southern United States and along both coasts. Populations have fluctuated widely but overall appear to be stable. Description: The head shape of the Canvasback is unique with its long sloping forehead and bill. The male has a chestnut-colored head, a black chest and rear end, and a pale gray body. The female has a pale brown head, and pale grayish-brown body. Voice: Females give a low, rough growl. Males make cooing notes in courtship. The head shape of the Canvasback is unique. The Redhead has a rounded and brighter red head, a darker gray body, and a blue bill. Habitat: In Tennessee, they are found in deeper lakes, ponds and rivers. Diet: Seeds, buds, leaves, tubers, roots, snails, and insect larvae. Status in Tennessee: The Canvasback is an uncommon migrant and winter resident in the state, but they may be locally common where suitable habitat and food is available. They arrive in late October and most depart by late March. The Canvasback has been known to dive to depths of more than 30 feet. The oldest known Canvasback in the wild was 29 years, 6 months old. 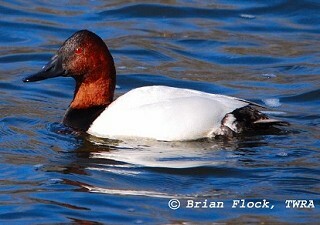 The Canvasback is a primary host for the parasitic egg-laying Redhead (A. americana). Canvasback nesting success is usually negatively impacted when this happens. Best places to see in Tennessee: Pace Point/Britton Ford area of Tennessee NWR, and other state and federal waterfowl refuges with deep water. Mowbray, T. B. 2002. Canvasback (Aythya valisineria). The Birds of North America, No. 659 (A. Poole and F. Gill, eds.). The Birds of North America, Inc., Philadelphia, PA.